So much yarn, so little time. : Meerkat Emergency! Treasure is missing! Last seen, mid January, in Estonia. She left 5erg and set out for Meltemsen in Turkey, and hasn't been seen since. Calling International Rescue! Please keep a look-out for this brave little meerkat - remember they're only around 5 inches tall! 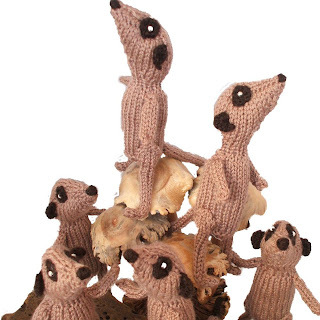 In the meantime another of the meerkat mob, Alchemy, has set out to MyMothersGarden, the next host, to keep the tour going. We're hoping Treasure will rejoin the tour once she's turned up! OMG... I hope he's save and will shop up quickly!!!! Poor Treasure! I hope she shows up soon! Goodness that's a bit worrying! 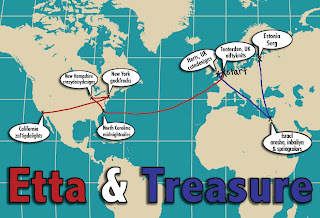 Oh dear, oh dear, wringing my hands.. hoping Treasure makes it to her hosts home yet this month. Sending good energy and vibes to the wee one; fearing she is trapped in a custom's barrel somewhere or was sent off the wrong port and make come back to 5erg in Estonia. How brave of little Alchemy, to step in and fill Treasures missing shoes on the journey. Such a lovely show of Meerkat family strength. Sending good thoughts and best wishes for the finding of Treasure to creator Mum Nifty as well. Hang tough old girl. Nifty, I'm going to consult my psychic today and see if she can get a "read" on Treasure's location. I'm lighting a candle for him and hoping he is safe. Thanks to sweet little Alchemy for stepping in. Well I hope he is just having a nice long chat with the customs agent and has lost track of time...you know there had to be a lot of sharing going on! Little Treasure's gone rogue, huh?! Hope everything's alright & she's just gotten stuck in customs & turns up safe & sound. This is dreadful! I mean assuming she is lost (and not lying on a beach in Turkey with a dark and handsome meerkat). That is excatly why Tzipi must be only shipped with registered mail..
Awww poor Treasure!! :( I really hope she turns up!